Pomp and pageantry come brilliantly to life in this comprehensive study of European clothing styles. This remarkable work not only describes the broad range of clothing worn by all classes of society during the medieval period, but also provides a fascinating view of medieval art and culture, history, and the lives and customs of lords and ladies as well as ordinary folk. The chapters focus on clothing worn during the reign of William I and the Norman Conquest of 1066 to the battle of Bosworth Field and the reigns of Richard III and Louis XI. This meticulously researched text contains nearly 700 finely detailed black and white illustrations, as well as 16 pictures in color depicting all types of apparel worn by all classes of society. Hairstyles, footwear, jewelry, headgear, weapons, table settings, even table manners, and more are also discussed in detail. 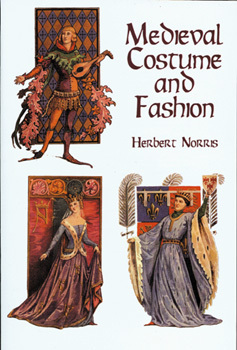 This book is an invaluable reference for costume enthusiasts, fashion designers, historians as well as a peek back into time to the Middle Ages that everyone else will delight in.